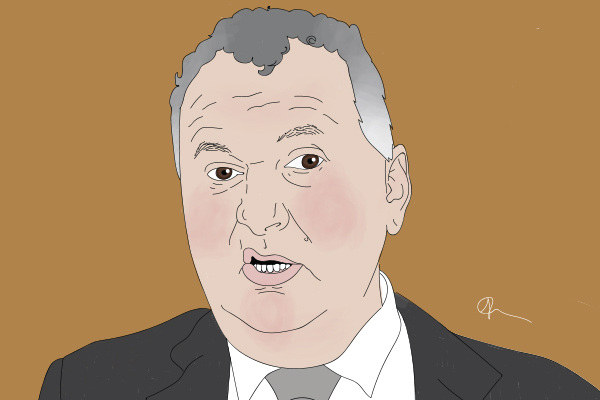 Shane Jones cartoon by Jacky Carpenter. He has also expressed his desire for the as yet unnamed new chief executive of the dairy co-op to be a Kiwi. On Friday morning, Fonterra chairman John Wilson announced his resignation, citing the need to recover from a health scare. John Monaghan, who has been a Fonterra director for a decade, will take over as chairman. Jones says his thoughts are with Wilson and his family and wishes him a full recovery. Recently, the New Zealand First MP has been a staunch critic of both Wilson and the management at Fonterra. Last month he called for Wilson to resign as the co-op’s chairman. Speaking to Interest.co.nz on Friday, Jones says with a new chairman – and soon a new chief executive – it is a good time for a reset in Fonterra’s management culture. This is not the first time a New Zealand First MP has put the boot into Fonterra’s top brass. He says this is an issue he has picked up on from farmers when he has been out in the regions. They have also been telling him they hope the next Fonterra chief executive will be a Kiwi. Theo Spierings stood down in March, after being CEO for seven years. Fonterra has not yet announced his replacement. If Shane Jones is hearing that from farmers, and i must admit I have heard the same, why isn't the board? Sort of proves the disconnect doesn't it? Sure does. But the culture in question in the “corporate” world spreads far beyond just Fonterra, and that includes “executive” in state services. I agree with your sentiment Foxglove. However, this issue is not just about unreasonable salaries. For Shane Jones (and New Zealand First), it is simply about selecting Frontera to ingratiate himself in the rural sector. The re-election campaign for New Zealand First began the day after the last election. The regional development slush fund is about New Zealand First seeking regional support, and in particular especially ensuring support in Northland which they have obviously targeted with considerable allocation of the fund to regain that seat. No one can say politics is as pediatric as it was! He's a mover and a shaker! The Jones Boy, nice one. Unrelated to this topic - I had my doubts at first but NZ First is the only party in power bringing some sanity to the otherwise leftie coalition and its sensationalist ideas. Just received word that NZ SMEs (employing fewer than 20 workers) have been carved out of the Employment Act amendment bill, which means they can continue with the 90-day trial period. Good job, WP SJ and team! But the linguistics of the piece are intriguing - health reasons? Of our waterways, perchance? Or Canterbury soil-quality? Fonterra is the logical expression of a totally illogical process - trying to feed (and profit from) an overpopulated world using a finite energy resource. Depending how you count it, dairying uses at least 10 calories of fossil oil to produce one calorie of milk. The question is what model of agriculture we morph to, given that this one is on borrowed time. My betting is that folk currently ' employed' in city churn, will migrate to the land in a sort of reverse of the migration away from it as fossil fuel took over from human and animal labour. Who is running the dinosaur is a question, sure, but what supersedes :) it is the bigger and more pertinent one..